The cardboard cutout cop — there’s psychology there! The cardboard cutout “scare-cop” at the Alewife T station. 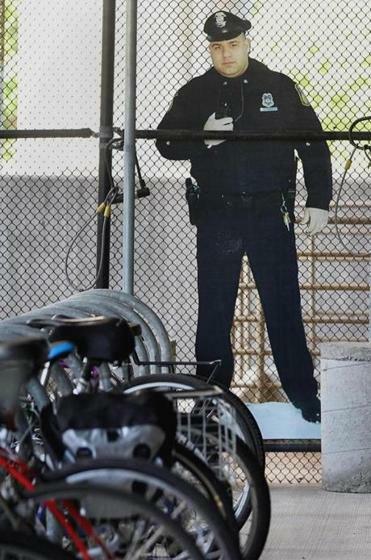 It was the unlikely solution to bike theft, first reported this week by the Metro and soon making headlines around the country: MBTA Transit Police created two life-sized cardboard cutouts of a real-life police officer, then placed them inside two busy bike rack cages at Alewife Station. And just like that, bike theft decreased by 67 percent. The cardboard cutout “scare-cops” (Get it? Scarecrow-cops!) may soon appear at other stations, though locations are yet to be determined, MBTA spokesman Joe Pesaturo said. As a deterrent to would-be thieves, it’s far cheaper than the overtime costs of posting an officer at the Alewife bicycle cages around-the-clock. But one big question remains: Why does it work? Transit Police Deputy Chief Robert Lenehan had a guess: “I think it’s our inner conscience. Even though they know that it’s not a real cop, there is some psychology at work,” he told the Metro. It turns out, he’s exactly right. I called up David Rand, assistant professor of psychology and economics at Yale University, and told him the T police’s new tactic. Rand, who studies cognitive behavior, was totally stoked. “This is really, really cool,” he proclaimed. Rand’s research centers on human cooperative behavior, trying to figure out why people, animals, and organisms work together for a common good — even if it comes at a cost to them as an individual. And much of the reason why we’re willing to sacrifice for the common good — to “take one for the team,” as it were — is because we don’t want to look bad. We monitor other people’s actions because we know their wrongdoings might have consequences on us. We judge the guy who steals from the cookie jar or cuts in line, because those cookies are supposed to be for all of us, and nobody wants to wait extra-long for their deli sandwich. That fear of judgment from friends and neighbors translates into self-policing: Being caught red-handed with your hand in the cookie jar is pretty embarrassing. And the need to preserve our reputation keeps society intact. Without the potential for shame, we would all steal from each other, which would feel rewarding for a little while — who doesn’t want a free iPod? — but would pretty quickly be bad for society as a whole. “If you think about the world we live in, reputation and concerns about reputation are a hugely powerful force in shaping human behavior,” Rand said. That feeling is so deeply ingrained — so fundamental to what makes us human — that we even feel it on a sub-conscious level, Rand said. Which brings us back to the scare-cop. There are all kinds of studies in the psychology world that support this: In one 2005 study, people playing computer games in which they allocate money to others are more generous when a pair of stylized eyes appears as the background image of their computer desktop. The same is true in office kitchens, Rand said — leave a box of doughnuts and a sign asking that people leave a dollar in payment, and they’re much more likely to adhere to the honor system if the sign features a pair of human eyes. His conclusion? Bring on more scare-cops! It may not be a midnight train to Georgia, but officials in New Hampshire are looking at the feasibility of extending the MBTA commuter rail to Plaistow, N.H. — an expansion that would establish the system’s only stop in the Granite State. Amtrak’s Downeaster makes stops in Exeter, Durham, and Dover. But in recent years, New Hampshirites have clamored for MBTA commuter rail service from Boston to Nashua, Concord, or Manchester in response to the state’s burgeoning tech industry and the increased popularity of city centers. And while Plaistow, with a population of 7,747, is no Manchester, it could be viewed as an easy test trial if the state wants to get in the public transit business: It’s just on the other side of the border from Haverhill, a little more than 5 miles north of the last stop on the Haverhill commuter rail line. The New Hampshire Department of Transportation will hold a public meeting about the proposed project on Aug. 22 at 7 p.m., at Plainstow Town Hall.